Hospitality management major Tawanda Cofield envisions being a CEO and nursing major Michelle Hedger plans to work in a hospice. Brittany Mosteller aspires to be a teacher, Frank Dixon, an aerospace engineer, and Christopher Washington, an oncologist. 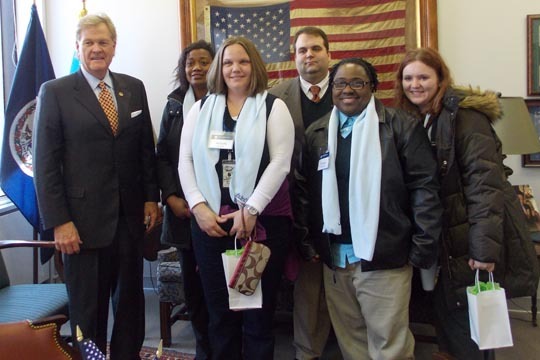 All of these students from Tidewater Community College’s Virginia Beach Campus shared their stories – and how their dreams would not be possible without community college – to delegates and senators at the General Assembly on Feb. 4. The morning visit to Richmond was part of the Virginia Community College System’s Legislative Days. After a briefing from VCCS Chancellor Glenn Dubois, students broke into groups and headed for scheduled sit-down meetings with Sen. Jeff McWaters (R-Virginia Beach), Sen. Frank Wagner (R-Virginia Beach), Del. Scott Taylor (R-Virginia Beach), Del. Ron Villanueva (R-Virginia Beach), Del. Glenn Davis (R-Virginia Beach), Del. Bill DeSteph (R-Virginia Beach), Del. Chris Stolle (R-Virginia Beach) and Del. Barry Knight (R-Virginia Beach). McWaters offered his own story, which included getting his start at Paducah Community College before transferring to the University of Kentucky. “Like many of you, I saw it as the best affordable option,” he said. He quizzed the students for their thoughts on the DREAM Act, which would give undocumented immigrants a pathway to higher education, and launched into a meaty discussion on healthcare. While the students thanked the lawmakers for their efforts toward funding community colleges, they didn’t shy away from pointed questions. “I’m afraid I’m not going to be able to pay the extra expenses when I transfer to Old Dominion. What can you do to help?” Hedger asked Taylor. The day culminated with Davis recognizing the TCC students in the Capitol at noon, noting the college was the second largest provider of undergraduate education in the Commonwealth. TCC’s own Jim Hines also shared his historical knowledge of Richmond, pointing out the stories behind the statues on the Capitol grounds and noting that Thomas Jefferson’s intent in designing the building was for it to resemble a Roman temple. “I loved how open and willing the representatives were in talking with us,” said Justin Robinson, who plans to earn his associate in general studies at TCC before transferring to Old Dominion for civil engineering.